When the Thanksgiving leftovers are on the menu for lunch and dinner, and you’re still playing high school football, you’ve done something right. In Kansas Class 6A, two teams have been right for some time and will each be in search of a second state title in three years when they square off Saturday for the state title in Emporia. Wait. How can that be? Thanks to a jump from Class 5A to Class 6A before the 2014 season began, Blue Valley is looking for its first Class 6A state title after having won six Class 5A state titles between 1991 and 2013. In fact, the Tigers have played for a state title 11 times during that 23-year span. This year, the Tigers have flown under the radar, to be completely honest. They were never really among the state’s top five and even stumbled into district play on the heels of a two-game losing streak. Not to mention the fact that they lost their starting tailback just before the state playoffs began. No worries. William Evans stepped in and has averaged nearly 200 yards on the ground over the past two weeks. 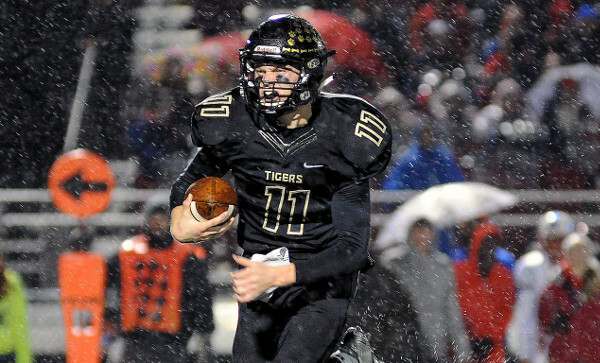 Add that to a dual-threat quarterback in two-year starter Colton McCumber and slippery receiver Gus Gomez, who had nine catches for 139 yards last week in the rain, and the Tigers are no longer under anyone’s radar. The only time the Panthers have tasted defeat came in week three when they traveled up to KC to take on Mill Valley – which might end up being the Class 5A state champ. They lost 27-20, but it didn’t seem to affect the Panthers much at all. They hung 49 on 2014 Class 6A runner up and perennial big-class power Hutchinson before going on a streak of six straight weeks of scoring at least 51 points. Offensively, the Panthers are tough to stop. And it begins with dual-threat quarterback Brady Rust. The senior passed for 222 yards and had another 139 on the ground last week in the Panthers win over a very talented Lawrence Free State team. “Derby is a great football team with great tradition,” Blue Valley head coach Eric Driskell said. “They are big up front on offense with a great quarterback and skill players. They are dangerous. If that sounds familiar to Blue Valley fans, well, it should because that’s what your Tigers bring to the table. In fact, the exact same quote could really be attributed to Clark. The mutual respect is not just lip service, either. These coaches know their teams will have their hands full on Saturday. “It will take our best effort in all three phases,” Driskell said. While both teams were state champs in 2013, that’s far from their minds. And both teams know the end is near, too.